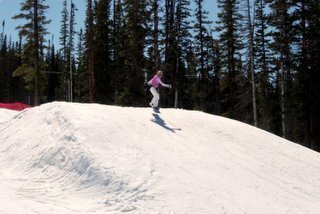 Just had to share the gorgeous day that we had over the Easter weekend closing out the boarding season up at Copper! Friday it was literally 60 degrees at the base! Although Saturday was 30! Eek! What a difference a day makes in Colorado – HA! I’m getting better at my jumps – woo-hoo! Too bad I have to wait til next year! I hope y’all got to enjoy some beautiful weather over the Easter holiday as well!